The Hanging Wet/Dry Bag is another great addition to the growing Planet Wise product line! Finally, a solution where one bag can carry your wet and dry items at the same time while keeping them separate. Each Planet Wise Hanging Wet/Dry Bag is sewn and sealed for no wicking or leaking, plus there is an added zippered dry pocket on the front and two handles so it can be easily hung on a doorknob or carried! The Planet Wise Hanging Wet/Dry Bag is the perfect solution for parents who cloth diaper and use day care - keep all your cloth diapers in one place and easily transport them back a forth. 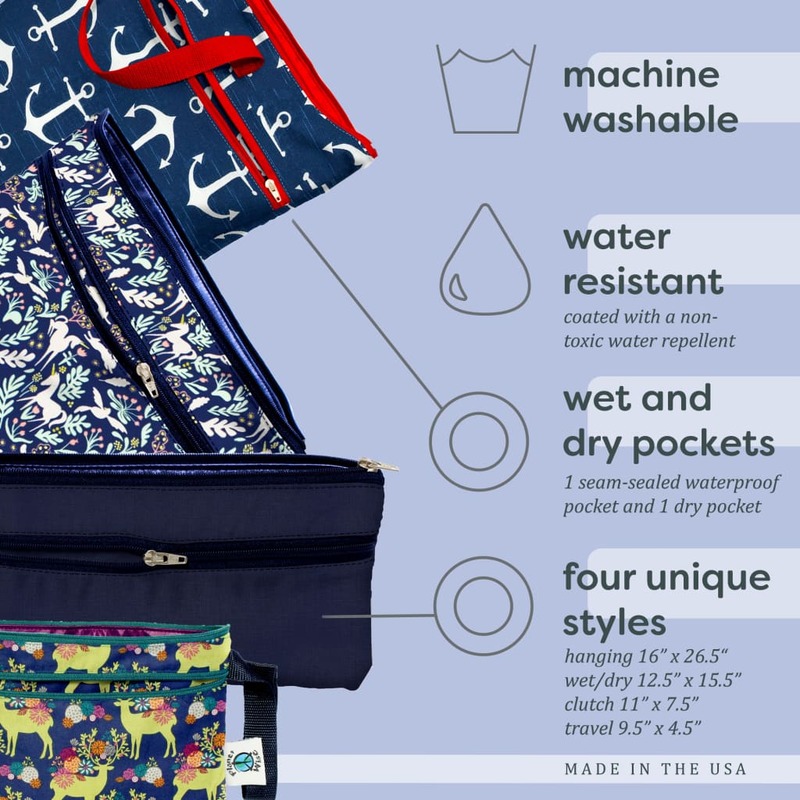 The Planet Wise Hanging Wet/Dry Bag is also great for when you are traveling for the weekend or if you don't want a traditional diaper pail. Both your clean and dirty diapers, towels, clothes, etc. can be carried in the same bag. Keep the clean or dry items in the front "dry" zippered pocket and the dirty or wet items in the zippered "wet" section keeping moisture and odors in. All Planet Wise Wet Bags are made with a high-quality polyurethane laminate (PUL) that is anti-microbial and inhibits the growth of bacteria and fungi. The Hanging Wet/Dry Bag is a generous 16" x 26.5" size and holds approximately 20-24 cloth diapers! Many great uses including wet/dirty items, swimwear, diapers, shoes, cosmetics, gym items, etc... list goes on and on. Machine Wash and Dry with Clothes or Cloth Diapers - No Bleach. Most waterproof material, when sewn, leaves tiny holes in the fabric allowing liquid to seep out over time. After a lot of research, Planet Wise Inc has discovered an innovative way to seal the seam so NO liquid can escape, even if you put water into the bag and squeeze!